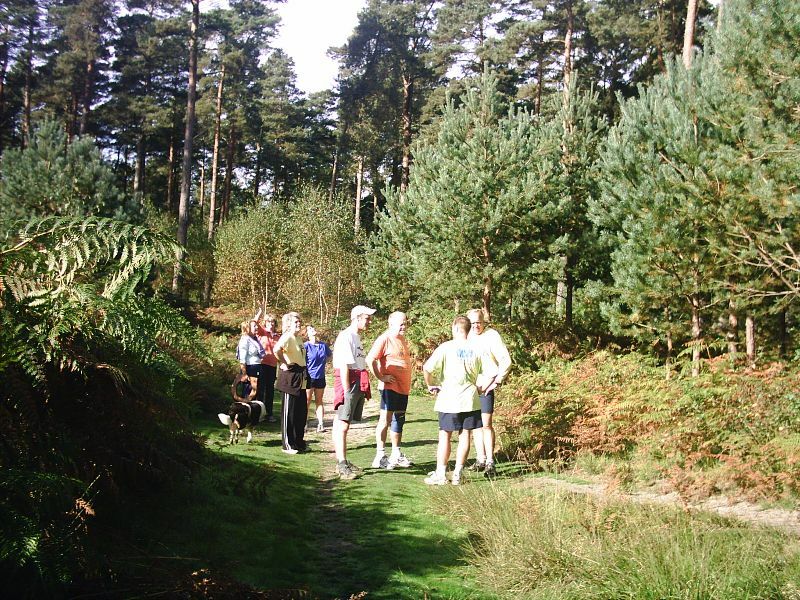 We all know where Lavington Common is don�t we? Just as well as the hares had decided that hash signs were a luxury too far and declined to offer us any. However the pack found its way with numbers being maintained due to Malibog and also Bouncer from Brighton to name just a couple of non CHI HHH members. The Can Man was not running due to an attempted suicide attempt where he leapt from a ladder at a height of 8 feet. (probably the thought of the next hash run). So there out of uniform he offered us a few wise words before passing us on to the hares who gave us little or no instruction and set us on our way. We jogged through the woods until the first check where The Eskimo found the On and the pack tumbled after her. At the next check Spiderman peeled off down a track and disappeared for a very long time with a distinct lack of calling, which was a pity as it was the true trail. Bouncer kept making comments like �We do it this way at Brighton� or �What does a falsie look like?� This did confuse most members of the pack as we very rarely even know our own rules without having to work through the complexity of them to explain to other packs. You run - You follow flour - You get lost - End of Story. A short stop as Vladimir tried to get Buster to follow him now that his master was injured and then on to the next check which led us to double back and we began to realise that we were heading in the direction of the river which with Splasher and Pancsi was going to be a wet affair. Bambi went charging ever onward but the double bluff was on when we tamely trotted over the bridge without getting our feet wet. Another check and neat little back check and then the trail led ---- to the riverbank. As steep as a tax increase after an election we attempted to scramble down. Old Faithful did the decent thing by scurrying across leaving �her indoors� (Resta the Rasta) to fend for herself - not the act of a gentleman (so he is in good company here then). Global warming had done its worst however and then river was more of a whimper of water than a raging torrent and it claimed no victims. Across to the other side and the most dubious falsie known to man (or hashers) when Pancsi claimed that a dot was not a dot but some white fungi. Whispers found the On and calling in his own quiet way under his breath, to himself, led the pack up the trail in the direction of the chariots (we thought). Bambi took the direct route but just a falsie and in the end it was The Eskimo who led the pack in through the undergrowth. The pack came back to the car park where Treefeller had been sorting out the pub and then discussed who should have the hashit. With Old Faithful�s disdain of his good lady wife that was easily sorted and the deed was done. So although we were a bit short (165 cms) due to the Great South Run it was a successful hash well laid by the hares. Many thanks lads.